Once again I have another gift idea to share with you. I know Thanksgiving is over and you are all beginning to stress out over the thoughts of everything you still need to accomplish. You have that long gift list and it is not going to get any smaller by itself. Well, here is something that just might help. Check out the Black Friday sales on Jewlr. And before you do, take a look at this beautiful ring I received from Jewlr. It has become my favorite ring right now. Two tiny hearts are side by side with my husbands birthstone in one and mine in the other. It also has our names engraved on it. It is very dainty looking, at least I think so! 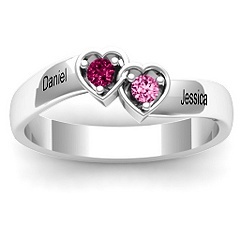 You can see the Double Interlocked Hearts Ring on the Jewlr website. When you order on Jewlr you also receive an extra gift. I received a heart necklace. Very feminine! I have a feeling one of my daughters will end up with this one! Neighbors be sure to check out Jewlr. Disclosure:I received no monetary compensation for this post. I did receive a ring and necklace for review purposes. All quotes in red are taken from the sponsor's website. All thoughts and opinions are mine.